My favorite part of any bird is the dark meat – besides the skin, dark meat is the only real “flavor country” found in foul. I’m particularly fond of duck because both the leg and breast meat is darker than you’ll find in a chicken or a turkey. But ducks are relatively small and, shall we say, flat-chested. A goose, however, is a much more curvaceous creature and offers quite a lot to love. Like ducks, geese fly quite a lot. And just like in any other animal (that I’m aware of), the more a muscle needs to work, the darker its meat will be. So, geese end up being an animal composed entirely of dark meat! But, if the idea of roasting a goose gives you anxious visions of forgotten kitchen timers and smoking ovens, let me assure you that there’s a better way. 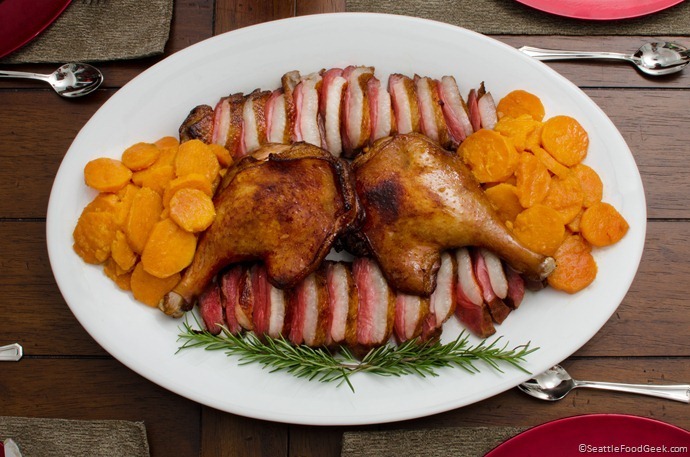 Just like a turkey or a duck or a chicken, a goose is a great candidate for sous vide cooking. I started with a whole goose, which I carved into four pieces: two breasts and two legs. I packed each piece in a vacuum bag with salt, aromatics and fat, then cooked sous vide. Just before serving, I shallow-fried each of the pieces to brown and crisp the skin. In reality, I treated the goose just like I was cooking duck confit, sous vide style. This was phenomenally easy, risk-free and wonderfully delicious. Many thanks to Whole Foods for providing a complimentary whole goose for the development of this recipe. Rinse the goose thoroughly and remove the neck from the interior of the body. Reserve the neck for another use. Remove the legs and thighs. With the goose breast-side-up, grab the end of the drumstick and pull the leg outward from the body of the goose. Cut through the skin underneath the rib cage as you pull the leg away. Flip the goose over and fold the leg away from the body until the “hip” joint is visible. Run your knife through the hip joint to free the leg and thigh. Trim away excess fat and skin, leaving enough to cover the meat. Repeat for the other leg. Remove the breasts by making an incision through the skin of the breastbone. Allow your knife to follow the contour of the rub cage on one side and peel the breast away as you cut . Trim away excess fat and skin. You may save the fat, carcass and wings for another use, such as a pressure-cooked goose stock. Combine the salt, juniper berries, brown sugar, rosemary and cinnamon in a large bowl. Mix to combine, gently crushing the aromatics to release their oils. Toss each goose piece in the salt mixture until well-coated. Divide the duck fat among four vacuum bags (or two, one for breasts, one for legs). Place the goose pieces in their respective bags and toss in any juniper berries and rosemary that may have been left behind. Vacuum seal on high. Refrigerate overnight. Preheat a sous vide bath to 62C. Add the goose legs and cook for 18 hours. If you’re not serving the goose immediately, remove the bag and chill in an ice bath. Refrigerate until ready to serve. Preheat a sous vide bath to 54C. Add the goose breasts and cook for 6 hours. If you’re not serving the goose immediately, remove the bag and chill in an ice bath. Refrigerate until ready to serve. Note: If you have two sous vide baths, you can perform the previous two steps simultaneously. If you only have one sous vide bath and don’t want to wait quite as long, you can turn the temperature down from 62C to 54C after 12 hours and add the breasts to the same bath as the legs. The legs won’t turn out quite as flaky, but they’ll still be delicious. Heat a large pot of canola oil 1/2” deep to 400F. Remove the goose from the vacuum bags and wipe off any juniper berries or rosemary that may be clinging to the skin. The meat will be wet from the duck fat, but that’s OK for frying. Working one piece at a time, fry the legs skin-side-down for about 1 minute or until golden brown. Flip and fry for an additional minute skin-side-up. Fry the breasts, skin-side-down only, for about 1 minute or until the skin is golden brown. Slice as desired and serve immediately. As you’ll notice in the picture above, geese have a hefty layer of fat underneath their skin. This helps them stay buoyant and warm, and I personally enjoy eating the fatty exterior, which is made soft and delectable by the long cooking time. However, if you want to reduce the fat layer and you have a little extra time on your hands, before step 4, remove the skin from each piece of goose. Using the back of your knife, scrape the fat away from the underside of the skin. Dust the skin with Activa RM (transglutaminase; meat glue) and place it back on the meat before vacuum sealing. It’s a little trick I learned from Modernist Cuisine, which has quite a lot to say about cooking tough and tender meat sous vide. We had friends over for brunch last weekend, so I pulled out an old standby: brioche with a 64°C egg, maple syrup, pancetta and pea butter. It’s my version of French toast, you know, because of the toast part. I’m not trying to sound snooty when I say this is “as simple as can be” because you do need a sous vide machine and a centrifuge to make it. However, provided you have those tools, the recipe brain-dead easy. When I was growing up, we used to go for brunch at a diner that made “sweet pea guacamole” served alongside a Tex-Mex omelet. 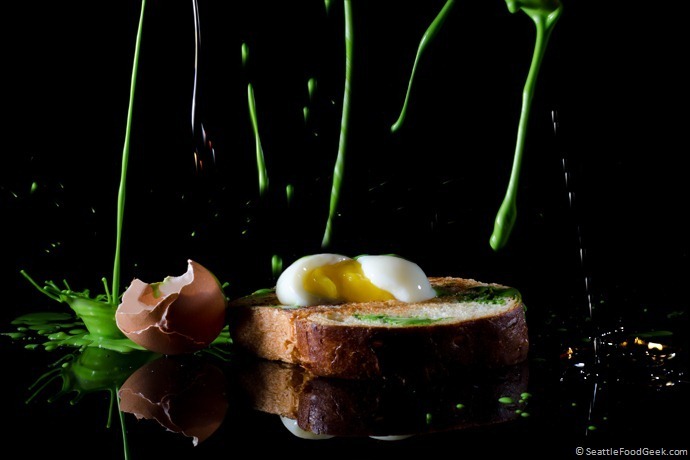 I loved the notion of having peas with breakfast, and once I discovered centrifuged pea butter, that was even more reason to work it into the dish. I’m sure there’s a “green eggs and ham” permutation of these ingredients, too; if you find it, please share. Make pea butter by blending 4lbs of thawed peas until smooth, then centrifuging at 1500 RPMs for 2-3 hours. Cook 4 eggs sous vide at 64°C for one hour. Meanwhile. cut 4 slices of brioche, about 1” thick. Toast on a flat-top grill with copious amounts of melted butter. Fry up 8-12 slices of pancetta. Pro tip: frying pancetta in a waffle cone maker keeps it from curling up. To assemble, top the toasted brioche with an egg. Pour over pea butter and warmed maple syrup. Finish with slices of fried pancetta. As you might know, I’ve been working on sous vide machine designs for a little over a year now. 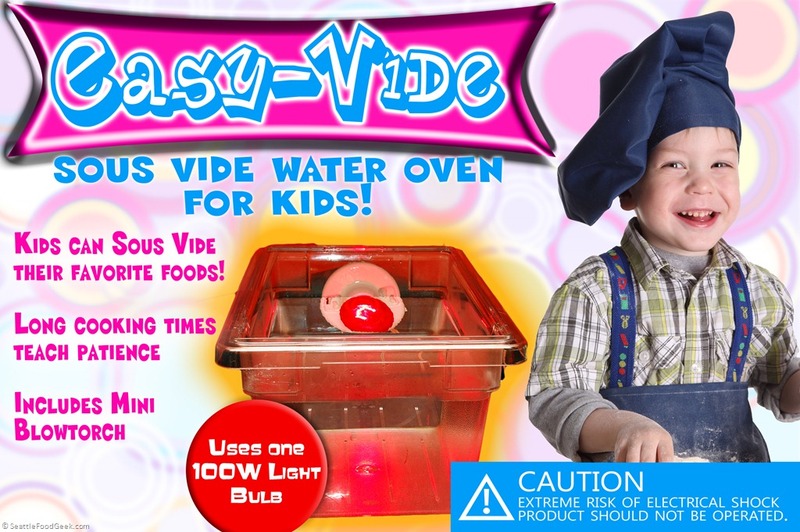 I’m happy to announce today that I’ve finally got a model ready for sale: the Easy-Vide Sous Vide Water Oven for Kids! I discovered that children are currently the biggest untapped market for kitchen technology, and in order to make sous vide cooking pervasive in the future, we need to educate the next generation of chefs and home cooks. I created the Easy-Vide to be the simplest, easiest and most fun way to teach kids about sous vide. Screw in the light bulb (included), fill the basin with water, and pug in the power cord. No pesky temperature settings to remember. The water bath is heated by the light bulb – it’s that simple! Works for all types of foods including steak, chicken, fish, and even vegetables! I’m still in negotiations with several retailers, so check back soon for pricing and availability. The Easy-Vide promises to be the must-have toy for the aspiring cook in your family!